It isn’t President Trump’s tweets that are leading Nancy Pelosi ever closer to a total mental breakdown. It’s the Democratic Party. Pelosi regained the House speaker’s gavel in January poised to legislate, but the consummate dealmaker is reportedly struggling to get control of a rowdy freshman class that is exposing divides in her caucus and fracturing party unity. 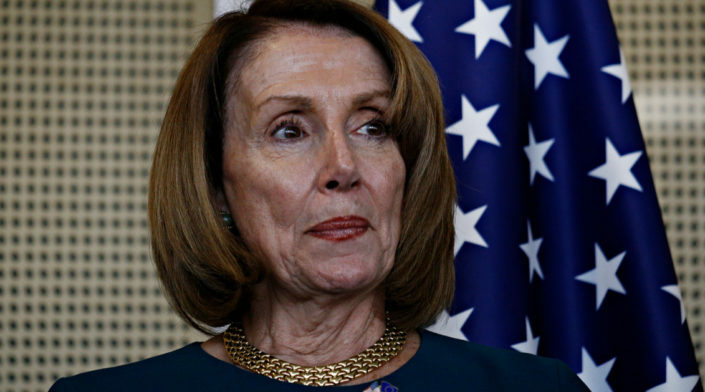 Indeed, Pelosi is increasingly tasked with saving the Democrats from themselves, writes Marc Thiessen in the Washington Post. Nancy Pelosi has a problem before her: her caucus is more extreme than ever before, with calls for impeachment, socialism, and rising anti-Semitism dividing the party, distracting from conventional policy goals and tainting the party’s image. The GOP is only too pleased; President Trump has made it clear that he loves what he’s hearing from the progressive wing of the Democratic Party, and even Pelosi seems to understand that a socialist agenda would be a “gift” to Republicans. Polls show that socialism, while popular with young people, does not enjoy general popularity, and respondents sour on Medicare for All when given a fuller picture of what it would entail, like longer wait times. But that hasn’t stopped the likes of Rep. Alexandria Ocasio-Cortez (D-NY), following in the footsteps of Bernie Sanders, from catapulting the policy to national prominence. Indeed, universal health care has now become boilerplate among Democrats running for president. Pelosi has struggled to tamp down calls for Medicare for All from within her ranks, but there is no denying that the policy has come to define the party line after a lurch to the far left of Pelosi in just the last two years. Republicans are licking their chops, too, on the trillion-dollar plan to eliminate greenhouse gas emissions in 10 years: the Green New Deal. Try as she might to distance herself from it — Pelosi called it the “green dream” and more recently, “the new green deal” — the Green New Deal has become an unavoidable topic of debate for Democrats seeking the presidency, and a source of seemingly limitless mockery from the right. Meanwhile, Republicans are forcing the issue, and they’re not allowing Pelosi to dissociate herself from it easily. There might be some good news for Pelosi, though. Both policy proposals have foundered in the House, with neither one picking up even half of Democrats’ support. Pelosi might hold the floor — for now — but as far as the media is concerned, it’s the freshmen radicals who are setting the national agenda. Despite lacking Pelosi’s endorsement, the Green New Deal and Medicare for All are getting loads of press, and they enjoy broad support among 2020 Democrats vying to stand out in a crowded field of progressives. A gift to the GOP? But the most dramatic sign of Pelosi’s fading control came this month in the anti-Semitism controversy set off by Rep. Ilhan Omar (D-MN). Pelosi struggled to forcefully condemn Omar’s remarks, eventually settling on a diluted resolution rejecting all forms of “hate” rather than rebuking the congresswoman. The anti-Semitism controversy exposed a divide between more conventional Democrats who support Israel, like Pelosi, and progressives who are critical of the Jewish state. But it also cast a shadow over Pelosi’s legislative agenda while prompting calls for Jews to exit the Democratic Party. The radicals certainly have passion, but Pelosi is a consummate dealmaker, and she understands the opportunity cost of pursuing a scorched earth coup attempt against a sitting president without compelling evidence of collusion. “It’s just not worth it,” she put it flatly. For the most part, the party still seems to be following Pelosi’s lead, but the vocal fringe persists, and it’s already leaving an imprint on the party’s national agenda. Pelosi wants to save the Democrats from themselves. Will they let her?